“Extra, extra…read all about it…” (No Spoilers!) It’s our final week in the rehearsal space before we launch into ourselves into our monumental tech week. Before I forget, I must say a huge thank you to all at 3 Mills Studios for accommodating us so hospitably and providing a hungry company with copious amounts of bacon breakfast paninis and skinny cappuccinos, we are most grateful! 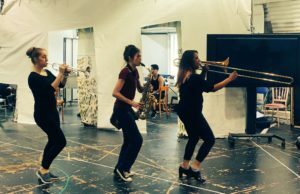 That aside, we had a week full of runs (of the show 😉 ), a Sitzprobe of Act 2 (see Wikipedia note from last week), 2 company birthdays and super excitingly – DRUM ROLL PLEASE ADAM – the arrival of the Pinball Machine! That bad boy is immense! There was plenty of blood and sweat but no tears thankfully as the entire company worked themselves silly to make our almost final product a fantastic one. 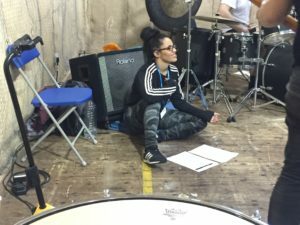 So on Monday we embarked on a Sitzprobe of Act 2 which was incredible for us to get a sense of what was REALLY to come musically. Donna (Mrs Walker), William (Tommy) and Natasha J (Dancing Demon!) 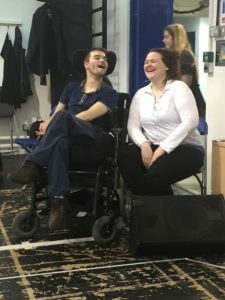 even sat on the Bass Guitar Amp to get a feel for the rhythms so that they could feel the music in another way being three of our Deaf actors in the company. Post lunch the band boys had their costume fittings where Steve (Bass Guitar) announced that he “walked around Angels (Costumiers) for 2 hours in his pants trying to find a suit that would fit him. Kerry (Director) politely asked: “Were you wearing good pants though?” Steve’s candid response was “NO!” Good over sharing Mr Simmonds!! Meanwhile, the rest of the company embarked on a stagger through of Act 1 in the more than capable hands of DC (Dan de Cruz) on the piano who came to cover while all of the music boys were playing dress up! During said run, we established that playing a Top ‘B’ on the trumpet during the reprise of Pinball Wizard makes Stacey (Mrs Simpson) almost wee a bit. I totally understand Stacey; I have the exact same feeling for most of the score! This was all amidst Max (Mr Walker) attempting to base his character on Frank Spencer, Garry (Uncle Ernie) contemplating making a ‘Dirty Martini’ using Rob (MD’s) can of ‘Bumblebee Tuna’ water and Kerry giving himself the ‘Director of Chairs’ Award (and the Olivier goes to..! ).This would all have been fine had William (Tommy) not shown his wicked streak by deliberately teaching me the wrong BSL signs for police, this is not the first time this behaviour has occurred, and I’m not going to disclose what he taught me being the consummate professional that I am, but let’s just say it wasn’t correct and not to be repeated in public! Tuesday opened with Shekinah (Voice of Mrs Walker) sporting a sensational new ‘experimental’ hairdo, Ali coining a new name for the two ‘Natashas’ when they’re together as ‘Natasha Squared’ (which I quite enjoy) and Steve (BSL Interpreter) admitting to falling asleep and missing his last stop on the train home hence returning to his house 1.5 hours later than expected – that’ll be the Canary Island jet lag!! We also learned that Tony (Guitarist) spent the previous evening trying out electric violins and admitted that he may be ‘going shopping’ later (funnily enough, this was the first that the creative team had heard of his ‘fiddling’ skills!) This info was sadly overshadowed by Kerry (Director) creating ‘Theatre Magic’ with the prop dining table and Alim (The Lover) asking the MD if he would prefer “a light flutter or a chest” – I know he meant vocally, but who else would?! Ultimately though, Tuesday was all about CHAIRGATE – as was the remainder of the week, and probably many weeks to come! Patricia brings in the cakes! Thursday morning gave me glorious joy as I witnessed Alim asking the lady at the McDonald’s Drive Thru machine “What’s the lowest fat thing you have on the breakfast menu?” #glorious. As soon as we settled into our rehearsals we were almost immediately evacuated due to a cheeky fire alarm, however, some of us were delayed in our escape due to Donna (Mrs Walker) taking the time to tweet as she meandered through the fire exit! Its ok Donna, we’ll wait! (Good thing she’s so lovely!). 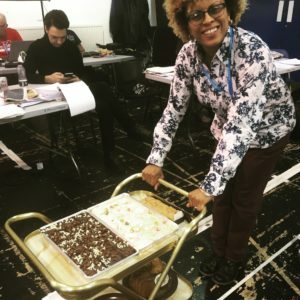 Once we were reunited with the rehearsal room, it was time for a tea break (I love my job) and, unexpectedly, the beautiful Jeni Draper (BSL extraordinaire) had supplied us with yet another batch of her sensational baked goodies, this time in the fab form of chewy chocolate flapjacks. Seriously Jen, NEVER leave us again! This was another yummy addition to the tonnes of cake that had reappeared as we celebrated the second company birthday of the week, this time for gorgeous Amy (Sally Simpson). Many Many Happy Returns Girls!! 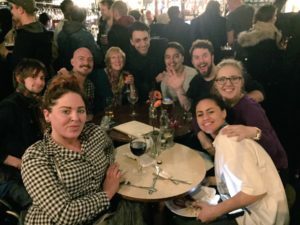 This was all in the midst of a fabulous run of the show in the rehearsal room where we were joined by a bunch of familiar and friendly faces from Theatre Royal Stratford East to encourage, love and support. We thank you, and from what we heard, the feedback was great. Well Done Team Tommy! The company in the pub enjoying a drink… or five. 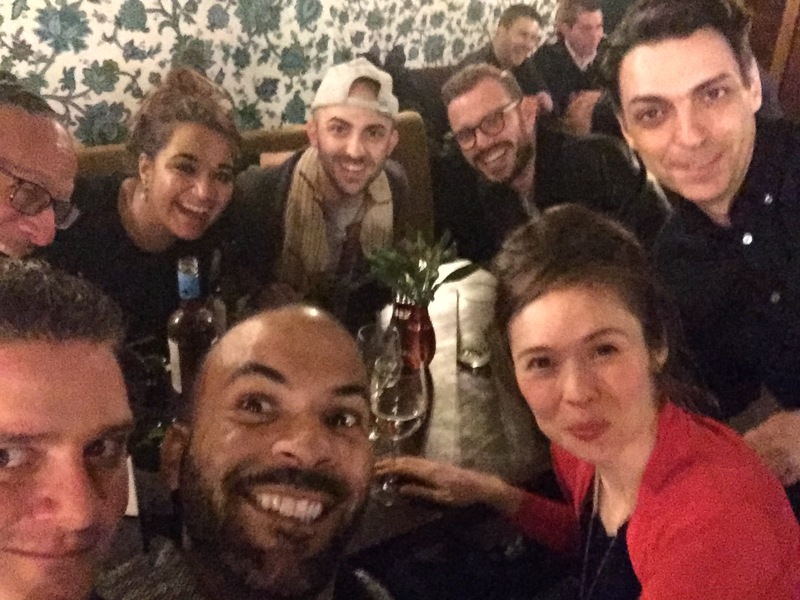 With all this uber hard work commencing, of course there was only one way to celebrate 5 weeks in the rehearsal room – a well-deserved sesh in the pub. What a wonderful bunch! Wow, we’ve worked hard – bring on the monster tech week where all the fantabulous magic will inevitably come together!